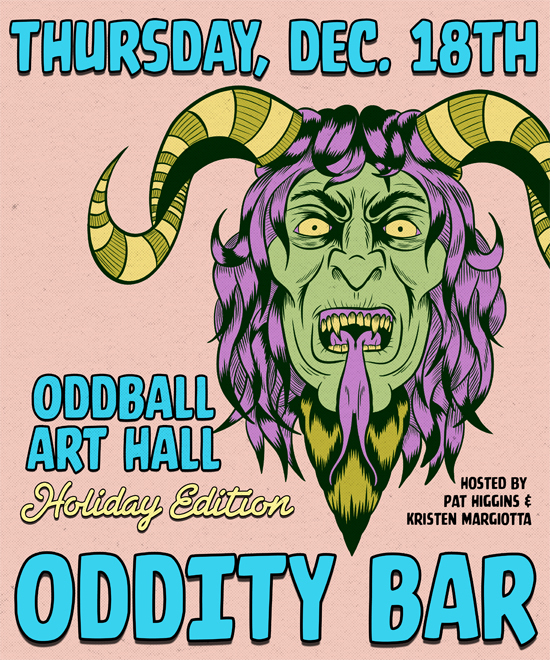 For the folks who don’t know, the Oddball Art Hall is an monthly art event organized/hosted by Kristen Margiotta and myself at Oddity Bar (500 Greenhill Ave., Wilmington, DE). Held on the third Thursday of each month, the event features over 20 vendor/artists (original art, prints, books, and other merch), live drawing, and music. The fourth installment is scheduled for Thursday, December 18th and will include a Santa themed model, some new artists, some returning artists and Oddity Bar’s Andrea McCauley playing some records for us. This one will be an excellent opportunity to shop local for the holidays, as well as networking with and meeting artists from the Delaware, Philadelphia and NJ areas. The official event page with the list of artists and details for the December OAH is here and you can stay up to date with all of the future events by following www.facebook.com/oddballarthall.